Heimataerde confirm to be part of the amazing "Kinetik-Festival 5.0" in Montreal, Canada. On May 17-20, 2012, Heimataerde conquer the stage with great bands as Combichrist, Haujobb, Panzer AG, [:SITD:] and many more at the famous "Kinetik-Festival 5.0". This will be your chance to see Heimataerde live! 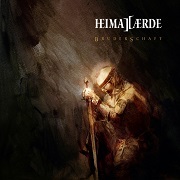 Do not miss the opportunity to listen to the absolutely brilliant music of Heimataerde.